Sagebrush leaves themselves—which are strongly aromatic and a shade of light green that seems to change with the weather—provide food to a variety of birds and fauna, including mule deer, white-tailed deer, elk, pronghorn antelope, bighorn sheep, and jackrabbit. 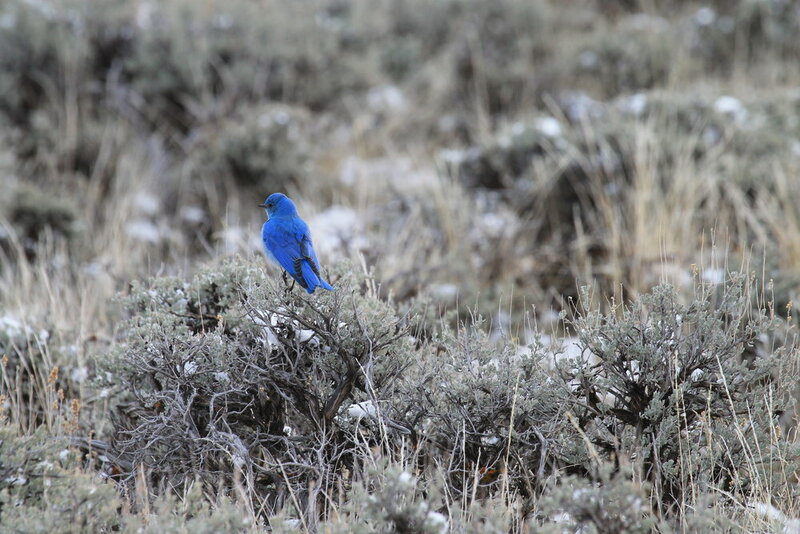 Nearly 100 bird species depend on sagebrush country for their habitat needs. Photo courtesy of the Bureau of Land Management. Article by Daly Edmunds, Audubon Rockies, and Hannah Nikonow, Intermountain West Joint Venture. Sagebrush country is beginning to thaw. Bird songs that have been absent for the past six months are again decorating the breeze. The transition from the drabness of winter to a more color-rich landscape is still a few spring snow squalls away, but the 40-degree sunshine feels like paradise in the arid high deserts of the West—to wildlife and humans alike. This year marks the centennial of the Migratory Bird Treaty Act, the most powerful and important bird-protection law ever passed. In honor of this milestone, nature lovers around the world are joining forces to celebrate the Year of the Bird and committing to protect birds for the next hundred years. As part of this yearlong celebration, March is dedicated to highlighting native plants and their importance to birds and other wildlife. With that in mind, we want to take this opportunity to feature Artemisia tridentata, or the sagebrush plant family. Those wide-open spaces so often associated with old western movies? That's what's known as "sagebrush country" today. Of course, the most important yet often overlooked feature of this landscape is the sagebrush plant itself—of which there are 18 species. Relatively short in stature (usually less than two-feet tall), the long-lived (some can reach more than 100 years), short-branched shrub plays an outsize role in this ecosystem. The plant is the foundation of an iconic landscape that supports a rich tapestry of wildlife and rugged western culture. As Mark Twain famously said, sagebrush country is a “forest in exquisite miniature." Healthy sagebrush plays a critical role in the hydrological cycle of the arid West. In the summer, the plant's tap roots, which extend 1-4 meters into ground, help it withstand the dry conditions. In the winter, these roots capture snow and retain moisture that supports other plants while helping to fuel rivers upon which urban communities rely. Additionally, healthy sagebrush plants help keep the soil intact when the ground is restored after being mined for resources such as oil, gas, and trona. Above ground, sagebrush serves as a nurse plant... Read the rest of this story publish here by Audubon.